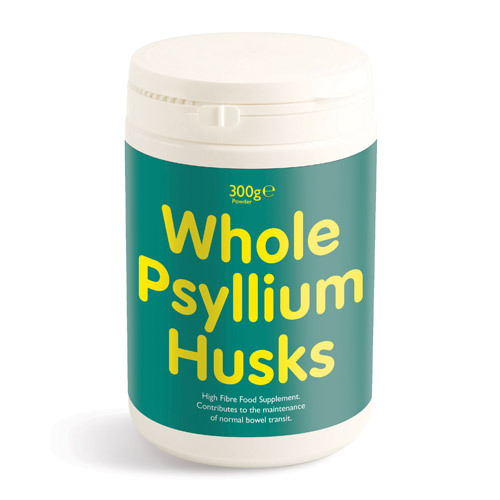 Whole Psyllium Husks are a great source of dietary fibre and are perfect for those with sensitive bowels as they are non-abrasive and wheat free. Adding whole Psyllium Husk to your diet will help support and maintain a healthier bowel, help the body in the support of regular bowel movements and help support and maintain a healthy digestive system. Clearly most people are now aware of the need to take in more fibre, particularly if you have sluggish bowels and for this many rely on fibre in their cereals. However, taking extra coarse or bran fibre is not the whole story. Bran fibre from wheat can be too abrasive for many, particularly those who have allergies to wheat. High fibre food for healthy bowels needs to be from none wheat sources and the best none wheat source of fibre are psyllium husks. Children / Young Adults: 0.5-1 (2.5-5g) heaped teaspoon mixed with a glass of water or juice once or twice daily and consume immediately. This should then be followed by a further glass of water. Children under 11 years of age should consult a doctor before taking this product. Can also be added to meal replacements or shakes. Use a blender to ensure they are well mixed in. You can also add to yoghurts. Ensure that you consume at least 250ml of fluid afterwards. All the Lepicol products have been approved by the Vegetarian Society except for the Lepicol Whole Psyllium Husk - 180 Gelatin Capsules. However with regards to vegan, each of our specific probiotic strains need various nutrition sources to aid their growth in culture. Below are reviews of Lepicol Whole Psyllium Husk - 300g Powder by bodykind customers. If you have tried this product we'd love to hear what you think so please leave a review. Whole Psyllium Husks are a great source of dietary fibre and are perfect for those with sensitive bowels.